Of all the waterfront views in Nashville, I have a million-dollar waterfront view. My view does not need celebrity status or Music City legacy to give it value. My Golden Pond draws endless value from those who explore it and make memories around it. 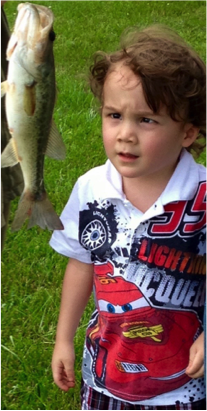 On my pond’s banks, a curly-head, four-year-old boy, discovered the joy of his first fish! His two favorite matchbox cars were thrown aside, so he could fully explore his first fish with both hands and both eyes. His mouth, wide open in awe, was larger than the wide-mouth bass he had just caught. Both the fish and the boy’s eyes were caught in the moment of first discovery. In that moment, my fair-headed grandson, Christian, was no longer a baby; nor toddler; nor preschooler. He had become a fully certified boy—for he had caught his first fish! Meanwhile his fascinatingly, autistic twin sister, Isabella, was busy trying to talk like the bullfrogs. Without any rules of pronunciation, she found joy in her ability to make a new sound. She was content just to repeatedly walk the circle of the pond’s banks. And each time she circled the pond, her eyes sparkled with amazement. Each time around the pond was like her first trip around it. Every journey filling her eyes with a new excitement of; blades of grass; wild flowers; or bullfrog sounds. She and the pond were one in the same. She could see hidden layers of nature’s beauty that only an autistic child has the gift to see. She didn’t need words to get to know the pond better. The pond allowed her to find wonder in just being a part of nature for that moment. No expectations of each other—just being one with each other. That simplicity of interaction delighted her. And she rewarded the pond’s generosity with the eternal light of her smile! And now, the pond is a little more golden from the light of her of her smile. The twin’s older sister, Dalayla, uncovered a secret garden under the limbs of a weeping-willow tree. She knows that it is not only a perfect pick-nick place for her; but also, a perfect pick-nick place for a mother bird to feed her new babies. The little girl’s hawk eyes will see and know every feather of each new chick, as they learn to fly. And as she sits on pond’s banks, and watches the chicks learn to fly, her own spirit will learn to soar upward in the same direction! I look out the window above my writing desk toward my Golden Pond. Tearfully, I realized that my perfect Memorial Day on my Golden Pond has faded into a new Monday morning, The gardener is here doing his weekly grass-cut. As he cuts round and round the outer banks of my Golden Ponds, my Nana-like heart wants to run out and bravely guard the sacred grounds of yesterday’s events. But then I realize, that cutting the grass on the pond banks only makes room for more growth. That room for growth will be needed for each of my pond-explorer grandchildren to find a new nugget of wonder on the banks of My Golden Pond.